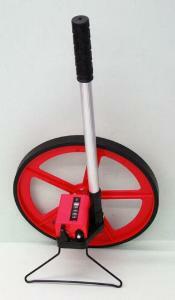 A trundle wheel makes long distances easy to measure. Roll the wheel along the ground to measure linear distance. A metered counter measures up to 99,999 meters, heavy-duty construction, telescoping handle for comfort, built-in stand which folds in, rubber wheel trim for accuracy and convenient carrying storage case.